Baseline the skills within a team for each team member. Set development goals and action items. Regularly review performance in relation to the development goals. Of course, the details matter. The OpenAgile Center for Learning has published a brief overview of how to use the Skills Matrix and a convenient A0-size pdf that can be used as a template for a team’s Skills Matrix. I highly recommend using these to get started. If you are a manager, ask your ScrumMaster or Process Facilitator to arrange and facilitate a team workshop to do the initial population of the Skills Matrix, rather than doing it yourself. Once that is done you have a baseline and you should take regular digital photos of the team’s Skills Matrix for record-keeping and as a backup in case of disputes. You should also let the team know that you will be basing performance reviews on how they improve their skills. The development goals that team members set then should be made such that every team member understands that they have a responsibility to diversify their own skill set and assist other team members in doing this. As a manager, you should review each team members’ goals for development and provide mentoring support when needed. At the end of a fixed period of time (quarterly is a reasonable period), you will review each team member’s development relative to the baseline and the goals set. Of course, normal guidance around performance (or lack thereof) can be given at these regular reviews. I strongly recommend reading “Drive” by Daniel Pink as an important adjunct to understanding how to do performance reviews for individuals in an Agile environment. In particular, individual performance reviews should not be tied to bonuses. If bonuses are used at all, they should be measured and delivered purely at the team level or organization level without measuring individual contribution. Of course, Agile team performance can’t simply be measured in terms of skills alone. Performance must also be related to bottom-line results. This part of performance measurement is separate from the development of the team. 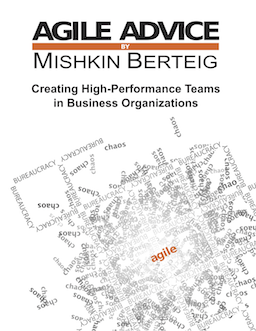 Another aspect of Agile team performance is how well they are doing Agile itself. Depending on the Agile method you use, there may be various tools to help with this (I would recommend our new product the Scrum Team Assessment as one possible consideration).